Stocks Drop - About To Have A 2nd Leg Lower? Stocks were extremely overbought earlier this week. With the 0.94% decline in the S&P 500 on Thursday, they came closer to normal levels. The CNN fear and greed index fell from 65 to 62. We aren’t out of the woods of this correction yet. But now I’m a little less bearish on the short term. The Russell 2000 fell 0.82% and the Nasdaq fell 1.18%. Twitter stock cratered 9.84% because of its earnings report. There are 3 potential catalysts to review as to why stocks fell on Thursday. First is they were overbought. Second is they were stifled by the 200 day moving average. Third is the negative news on the potential for a trade deal with China. The 14 day RSI was above 70 and the CNN index signaled greed. Furthermore, the NDR trading sentiment index indicated excessive optimism and the percentage of stocks above their 50 day moving average was elevated. As you can see from the chart below, the S&P 500 hit a ceiling when it bumped up against its 200 day moving average. The 200 day moving average was a valuable tool last year as it acted as a floor. Now it’s acting as a ceiling. I think the combination of stocks being overbought, the 200 day moving average ceiling, and the negative trade news combined to hurt stocks. This means if positive trade news comes out, the 200 day moving average will cease to be a ceiling. Stocks can either stabilize for a few weeks or fall about 3% to 5% for them to no longer be overbought. In the meantime, my opinion on the market will still be affected by earnings and economic data. As of Thursday afternoon, 70% of 324 S&P 500 firms have beaten their Q4 estimates with 17.6% growth. 61% of firms have beaten their sales estimates with 6.4% growth. I’m mentioning this because it’s not a guarantee I will be hugely bullish if stocks fall 3% from here. 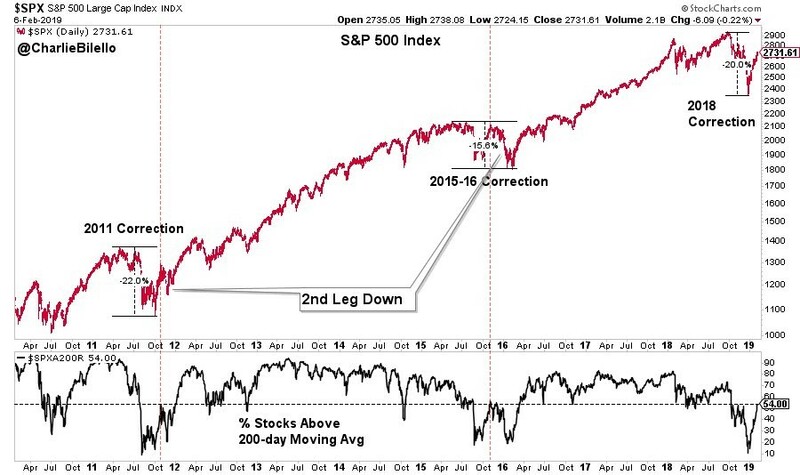 The chart below compares the current correction with the past 2 corrections since the 2009 bottom. In the past 2 corrections there was a sharp 2nd leg down. But in 2011, the S&P 500 fell 22%, bounced 20%, and then declined 10% which didn’t cause it to hit a new low. In 2015-2016, the S&P 500 fell 15.6%, bounced 13%, and then fell 14% on its 2nd leg down hitting a new low. Stocks Drop - There’s no rule to suggest stocks must correct a 2nd time, but it wouldn’t be a surprise given how oversold they are. I don’t think a new low will be made because the economic data has been solid and the Fed is dovish. Therefore, I’d be a buyer if stocks fell nearly as much this time. The decline last year was 20% and the bounce has been 16.6% which is right in between the sizes of the previous two. 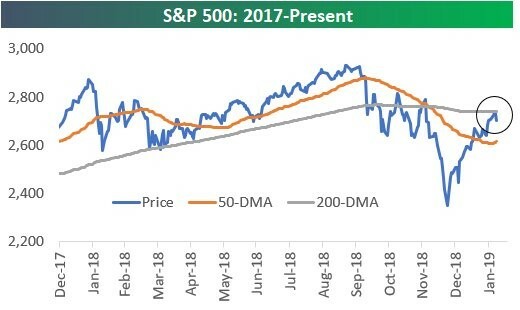 As the bottom chart below shows, the percentage of stocks above their 200 day moving average is similar to the percentage peak before the 2nd leg down in the previous two corrections. The only sectors that were up on Thursday were real estate and utilities as they increased 1.27% and 0.8%. Utilities underperformed during the rally this year. This was even though it is the only sector that had Q1 earnings estimates improve this year. If stocks go on a 2nd leg lower, we could see utilities outperform. Worst sectors were technology and energy which fell 1.44% and 2.13%. They just happen to be the 2 sectors with the worst Q1 estimate declines based on FactSet’s numbers. 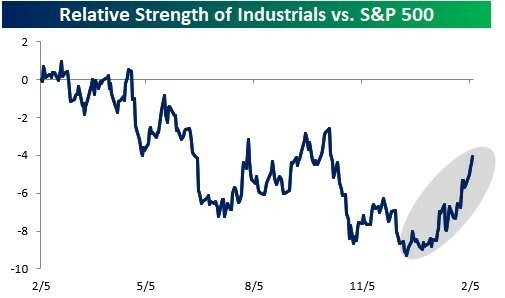 Industrials sector was down 0.75% which means it modestly outperformed the S&P 500 on Thursday. That has been a consistent trend in the past few weeks as you can see from the chart below. You would think the industrials would be selling off because of the global developed world slowdown. However, they are probably rallying because of the American manufacturing rebound in January. This sector has certainly been helped by Boeing which is up 37.74% since Christmas Eve. Big news on trade was that President Trump and President Xi Jinping won’t be meeting in person before the March deadline. On Thursday Larry Kudlow stated there’s “a pretty sizable difference” between the 2 sides. That’s important in my opinion because Kudlow is usually bullish on the odds of a trade deal occurring. It’s highly unlike a trade deal is made by March 1st. If enough progress has been made, I think both sides will push the deadline back a few months. If not enough ground has been covered, both sides may give up and go back to having a trade war. Bonds have been rallying in the past few months and have been recently approaching their 2019 year low in yields. The 10 year yield has fallen to 2.65% and the 2 year yield has fallen to 2.48%. While the difference between those is still normal (17 basis points), the 5 and 3 year yields are closing in on falling below the Fed funds rate. The top two charts below are slightly misleading because they use the top end of the Fed funds rate range. 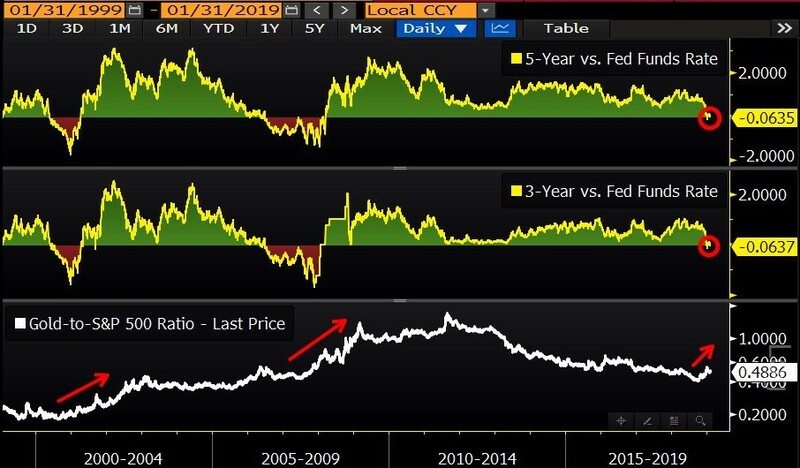 Current effective Fed funds rate is 2.4% which means the 5 year yield is currently 6 basis points higher than it and the 3 year yield is 5 basis points higher. Those are still significant indicators. If the Fed raises rates one more time, even the 10 year yield could be below the Fed funds rate. That would assure a recession in the next year. This is why low inflation is critical to keeping this cycle going. That being said, if inflation picks up, nominal yields will rise, so a rate hike might not cause an inversion.